Student accommodation in the UK is a growing industry, attracting considerable business interest and investment. A good indicator of the strength of this sector is that that the Student Accommodation Awards 2018 evening was sold out weeks before the event took place, 12 December. The annual Conference and Awards are organised by Property Week magazine. Held at the InterContinental London, O2, the conference theme was ‘Best in Class. How do we ensure the sector graduates to the next level?’. The conference agenda proved popular with leading developers, operators, investors, agents and the like, and was followed by the industry Awards in the evening. 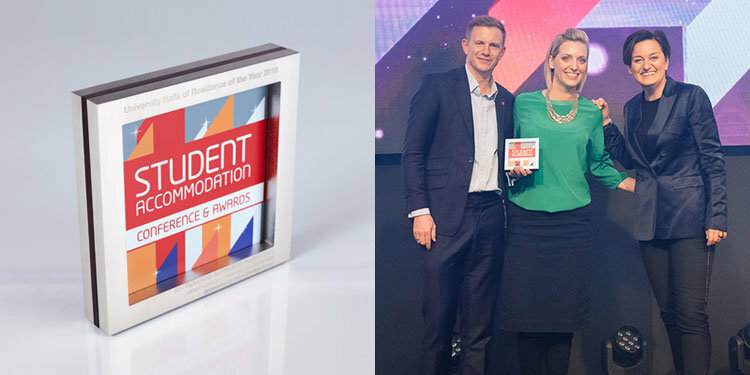 There were twelve Awards presented, including Developer of the Year (Urbanest), Agency Team of the Year (Savills (UK) and Unsung Hero (Anna Lockey at University of Plymouth). Attracting a respected panel of judges is a key element of putting on a successful awards event. 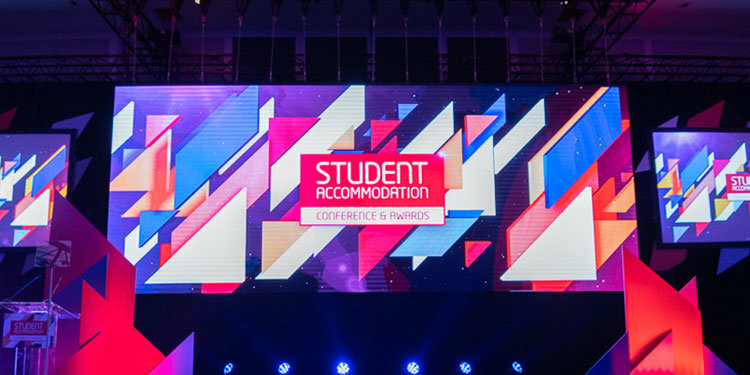 The organisers of the Student Accommodation Awards reported that they look for a mix of judges, who are well known in the industry and newcomers who bring new experience and opinions to the table. Evidently, most people approached to be judges are keen to be part of these Awards, which invariably provide them with invaluable networking opportunities. The design of trophy reflects the brand graphics of the event, including a background pattern featuring a montage of multi-coloured, geometric shapes. The style is a modern interpretation of a framed picture or certificate, manufactured in layers of brushed nickel plate and red acrylic. The frame is seamless, cut from one piece of metal, and given a contemporary finish of brushed nickel plate and then laser engraved with the winner’s details. The bold, central graphics are digitally printed onto the acrylic and are spliced through the centre of the award. From whatever angle, they look smart, professional and striking. This is the third consecutive year that EFX has produced the trophies for this event and the organisers appreciate the dedicated service they receive: “We have one point of contact, Shelley, who is always quick to come back to us with a ‘well put together’ quote and deadlines. She’s very professional and nice to liaise with. The quality of trophies is good and they are always delivered on time”.